Re-elect Rep. Roger Goodman, D-Kirkland, to represent the 45th Legislative District in Position 1. 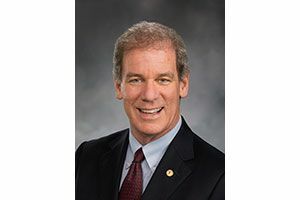 State Rep. Roger Goodman’s legislative career has been devoted to keeping Washington state citizens safe and nurtured. The Kirkland Democrat is chair of the Public Safety Committee and focuses on reducing harm, whether it’s holding drunken drivers accountable (think ignition locks) or protecting victims of domestic violence, thwarting human trafficking and improving the foster-care system. A strong advocate for the youngest citizens, he sponsored a bill to make access to a preschool program for all low-income families an entitlement. He’s still fighting to get that fully funded, noting that investment in preschoolers can pay off in higher achievement in later years. Strengths: As House public safety chairman, Goodman, D-Kirkland, has focused on improving life for Washington's citizens by holding drunken-drivers accountable, protecting foster kids and domestic violence victims and trying to stop human trafficking. He voted against the Legislature’s 2017 bill to answer the Supreme Court education funding mandates, not because he disagreed with the goals, but because he felt it unfairly applied tax increases to urban districts such as his. He wants the Legislature to work on property tax relief. He wisely does not think the new cap imposed on local school levies should be lifted — it’s too soon in the process. His opponent, Mike Curtis, is an engineer who has worked as a consultant, and in engineering roles for several large tech companies. The Republican, who lives in the Redmond Ridge neighborhood, wants to bring his expertise to the Legislature, streamlining processes and helping with transparency. He rightly is upset with how the Legislature, including Goodman, tried to exempt itself from the Public Records Act. Goodman acknowledged the process was deeply flawed and regrets the episode. However, Curtis would support a lift on the school levy cap and seems not to understand the complexities of the education funding system. We encourage Curtis to stay involved in politics, but he does not make a strong case to turn out Goodman.